Look at the cover with your child. Have your child guess what Splat’s job is and what he has to do every day. 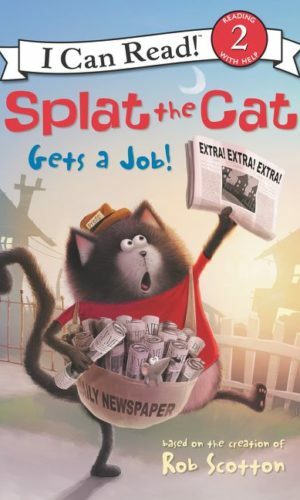 Ask your child to guess what Splat may be saying to his neighbors as he does his job. Get creative and silly! Why was Splat so excited when he came down the stairs to talk to his mother? What did he show off to her? Why was Splat late to work on his first day? What time did he set his alarm to initially and what time did he actually wake up? What did Splat and Kitten find in the toy chest to create a new alarm clock? How did this new alarm clock work? Did it help Splat wake up on time? What time do you wake up in the morning? What helps you wake up on time? Since the newspapers were heavy, what did Splat decide to do to carry them around town? Was this a good idea? Riding a bicycle and using a slingshot at the same time did not work well and it was dangerous. What did Splat and Kitten come up with next to deliver the newspapers safely and on time? This book shows the consequences of not being prepared or ready to do something on time. Take the opportunity to go over how Splat’s neighbors were affected by his actions.Talk about how you make sure to get ready on time in the morning and what your child can do to make their morning routine easier.